An attack on one woman in Kobani is an attack on all women, and an attack on one person in Kobani is an attack on humanity. We have to help. 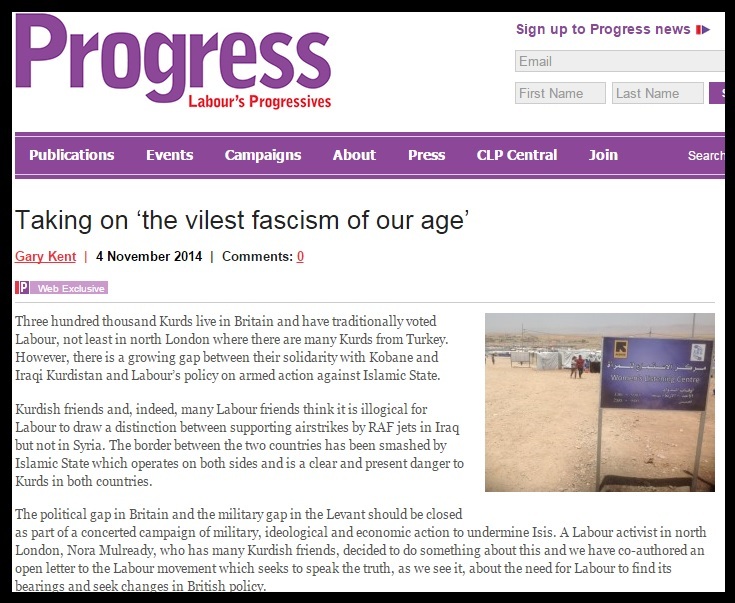 This is a quick post to highlight this article written by the excellent Gary Kent, Labour Party member and Director of Labour Friends of Iraq for Progress. It reiterates the case I along with many (and an increasing number of) Labour members and trade unionists have made about the urgent need for increased humanitarian and military assistance to those fighting in the front line against ISIS. At the rally for Kobane in Trafalgar Square on Saturday some of the more typically “hard left” speakers railed against Turkey for “standing by”. They suggested that Turkey has a moral responsibility to throw their military might into the fight against ISIS. Leaving the rights and wrongs of Turkey’s inaction to one side for now, I would ask that Mark Thomas et al reflect on how they can condemn Turkey for refusing to add their military might, while demanding that Britain and America do just that.